These Vanilla Cupcakes with Peppermint Frosting are light, fluffy, and topped with a sweet peppermint swirl. 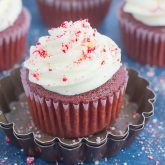 Easy to make and bursting with flavor, these cupcakes are the perfect sweet treat to add to your holiday baking list! I know we’re still two weeks away from Thanksgiving, and full-on Christmas mode hasn’t started quite yet, but I just couldn’t wait to share these Vanilla Cupcakes with Peppermint Frosting! Consider it a holiday preview for all the delicious goodies to come over the next few weeks. Not only am I excited to share this recipe because of how decadently tasty it is, but also because this is my very first cupcake recipe on Pumpkin ‘N Spice! I know, I KNOW! So sad, right? But, I have a reason. I’m not the best when it comes to frosting cupcakes. Let me rephrase…I look like a 5 year old frosted cupcakes when I do it myself. Fine for a little kid, but for me? Not so much. Luckily, I’ve had my fair share of frosting practice (and cupcake batter recipe testing, too). 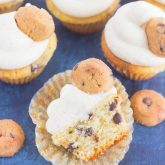 Over the past year or so, I’ve created a few cupcake recipes to share, but they still needed a few tweaks here and there. But, I’ve finally got it right, so it’s time to share. But, before we jump into the recipe, let’s talk about my love for Bob’s Red Mill Flour. It’s my go-to product of choice for all of my baking and cooking needs, especially around the holidays. I always keep my pantry stocked full of their Organic Unbleached All-Purpose White Flour, and even keep a package of their Organic Almond Meal/Flour and Gluten Free 1-to-1 Baking Flour on hand, just incase the mood strikes. And since I’ve already tested a few (ok A LOT) of holiday recipes, you can bet that Bob’s Red Mill Organic Unbleached All-Purpose White Flour has been by my side. This kitchen staple is versatile and is perfect for all of my baking needs throughout the year. Plus, it’s the same high protein flour used by professional bakers. Bob’s Red Mill Organic Unbleached All-Purpose White Flour creates high and textured loaves of bread, as well as light, airy, and delicious baked goods. And that’s where this holiday dessert comes in, made with Bob’s Red Mill Organic Unbleached All-Purpose White Flour. And you can’t go wrong with a classic vanilla cupcake. The recipe itself is fairly simple…it’s just your standard cupcake ingredients, followed by a good dose of vanilla extract. And vanilla Greek yogurt to keep the cupcakes extra moist. Now, you know I’m all about the easy recipes on Pumpkin ‘N Spice, so trust me when I say that these cupcakes are simple to make. Everyone is busy around the holidays, so the last think you need is a super-duper time consuming dessert. Unless that’s your sort of thing. But since you’re hanging around here, I’m pretty sure you love the easy dishes just as much as I do. To start, you’ll prepare the batter for the vanilla cupcakes. Simply mix together the dry ingredients, followed by the wet, and then stir to combine. Pour batter into a 12-count muffin tin and let the oven work its magic. Easy peasy, right? Now comes the hard part…waiting for the cupcakes to cool in order to frost them! It’s tough, but it’s worth the wait. Trust me. And that peppermint frosting? Oh-so GOOD! It’s sweet and packed with a hint of peppermint that’s not too overpowering, which is just the way I like it. And to make it pretty, I sprinkled some crushed candy canes on top. 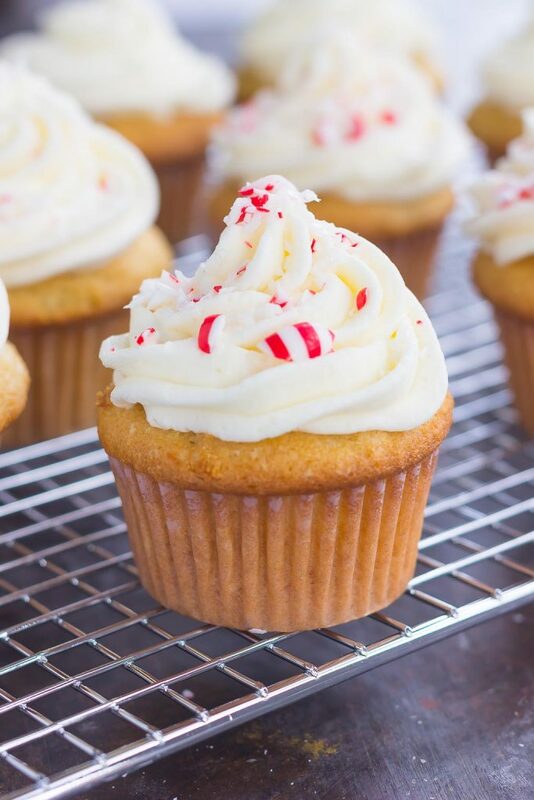 In no time, you can have these Vanilla Cupcakes with Peppermint Frosting ready to impress your holiday guests. 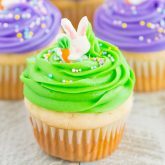 The vanilla cupcakes are soft, moist, and flavorful, while the peppermint frosting gives it just the right amount of sweetness. One bite and I guarantee you will have found your new favorite holiday cupcake! 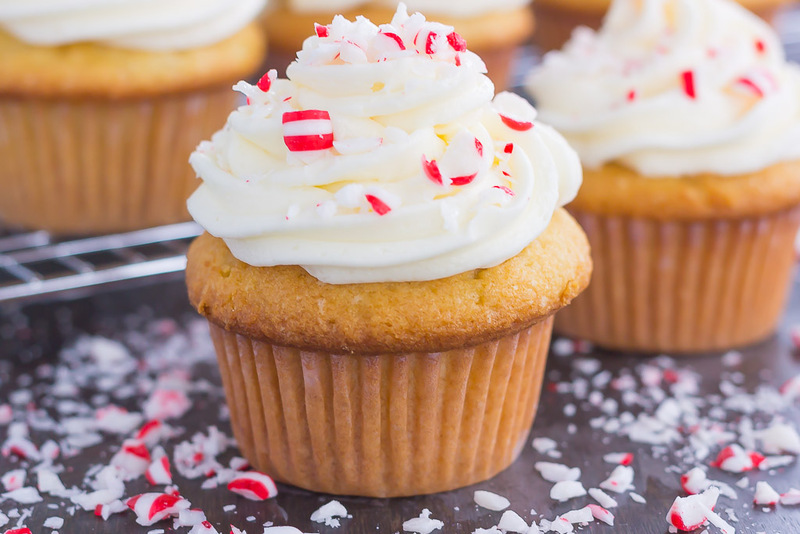 So grab those ingredients and whip up a batch of these easy and oh-so delicious Vanilla Cupcakes with Peppermint Frosting today. You’ll be glad you did, and your hungry guests will thank you! Head over to this website to receive a coupon for Bob’s Red Mill Flour! Preheat oven to 350F. Line a 12 count muffin tin with paper liners. Set aside. 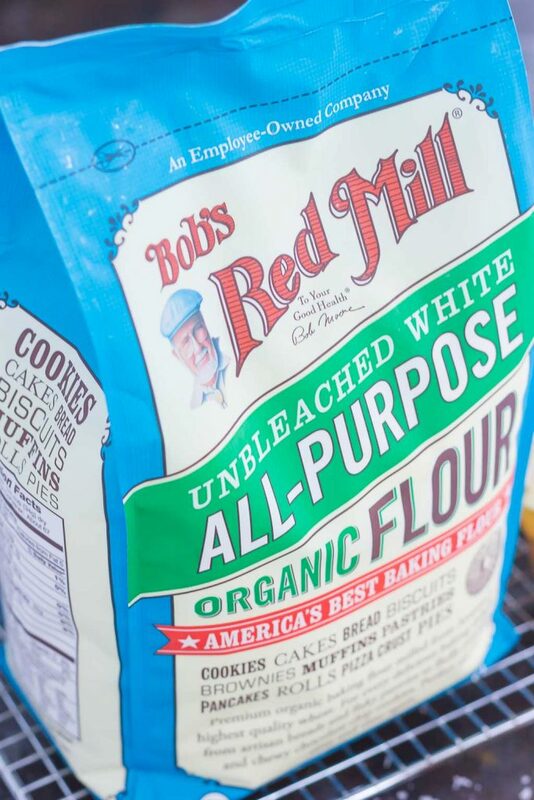 In a medium bowl, whisk Bob's Red Mill Organic Unbleached All-Purpose Flour, baking powder, baking soda, and salt. Set aside. In a large bowl, beat eggs and sugar with a hand mixer or stand mixer with fitted paddle attachment until pale yellow and fluffy, about 2-3 minutes. Add softened butter and vanilla extract and beat until incorporated. 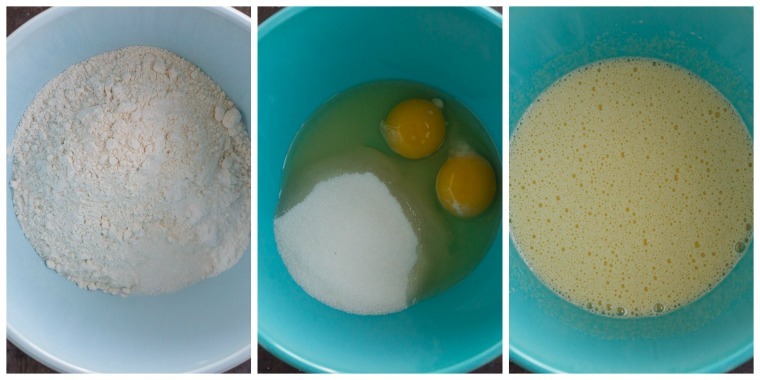 Pour flour mixture into wet ingredients and stir until just combined. Spoon batter into prepared muffin tin, filling about 3/4 full. Bake for 18-20 minutes, or until toothpick inserted in middle comes out clean. Let cool for 10 minutes in pan, and then move to a wire rack to cool completely. To make the peppermint frosting, cream softened butter in a large bowl until light and fluffy, for about 3 minutes. Pipe or spread over cooled cupcakes. Then top with crushed peppermint candies/candy canes. Althernatively, you could stir candy into frosting and then pipe, if desired. I think you definitely redeemed yourself for the cupcake situation! Better late than never to a cupcake party right?? These are seriously SO gorgeous, Gayle!! 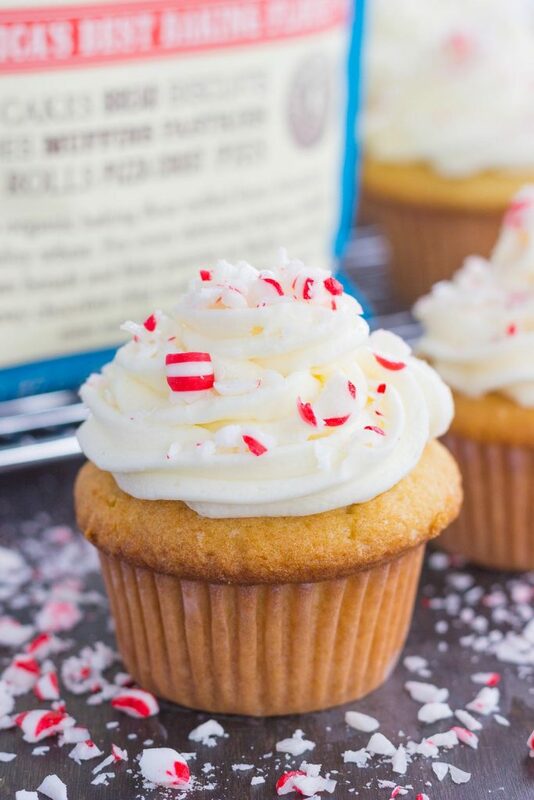 That peppermint frosting is just calling my name! Haha so true, Sarah! Thanks for the cupcake love! Those seriously look like some of the most perfect and beautiful holiday cupcakes I've ever seen. I'd like to sink my teeth into one right now! Yay! I'm so excited that you shared a holiday recipe! And cupcakes to boot?! Woo hoo! Your frosting looks awesome, Gayle! My frosting technique definitely leaves a lot to be desired. I'm the one who is like a 5 year old frosting cupcakes. I definitely need more practice and if that means I get to get more cupcakes, then so be it. Gotta do what ya gotta do, right ;) ? I'd have no problem eating one or three of these right now! 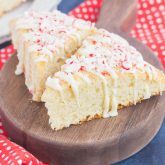 That frosting sounds divine and love the addition of candy cane on top. Pinned, of course. Have a wonderful weekend, my friend! I love your thinking, Dawn! More practice means more cupcakes, and more cupcakes equals happiness. What could be better? :) Thanks for the kind words and pin friend! Hold up. Gayle! It is NEVER too early to share cupcakes...even if they have a holiday feel to them! I mean, you could have shared these in July and I wouldn't have been mad at ya one bit! ;) These look delicious! I love classic vanilla cupcakes and that Peppermint Frosting sounds like the perfect finishing touch! Oh, and your frosting skills are totally on point if you ask me!! I could definitely learn a thing or two from you! Pinned of course! Cheers! Ok, glad it's not too early! I know some people have strong feelings about when it's appropriate to share for the holidays! :) Thanks for the sweet comment and pin, Cheyanne! I'm in full on holiday mode - both turkey day and christmas! haha Normally I don't get into christmas until after thanksgiving but for whatever reason this year is totally different! Loving these cupcakes! And of course Bob's products - total staple at our house! Yay for being in holiday mode already! The earlier the better, right? :) Thanks for the kind words, Ashley! Pretty as a picture, and I just know they taste as good as they look! Thanks for the cupcake love! Gayle your cupcakes and frosting look gorgeous! I'm ready to move onto Christmas things now. Glad you're posting some. I'm totally gonna start now too. Wish I could grab one of these cupcakes through the screen and have it with my coffee!! Looks amazing! Yay for your first cupcakes and Christmas recipe this year, Gayle! Love the gorgeous frosting on these yummy cupcakes! The vanilla and peppermint combo is perfect for the holidays! Thank you, Kelly! I love peppermint and vanilla together! I've been dying to start peppermint baking, but it just doesn't feel quite right. But I'm sure that will change soon ;) These cupcakes are so pretty and perfect for the holidays! It looks like you're a pretty good cupcake froster to me!! I know what you mean, this is the earliest I have ever posted a Christmas recipe! It feels different, especially since it's so warm outside still! :) Thanks for the cupcake love, Megan! I think you did a great job with piping Gayle! The cupcakes look perfect! You did a perfect job of frosting these cupcakes, Gayle! Not that I would have noticed any imperfections with all of the pretty crushed peppermint candies on top. 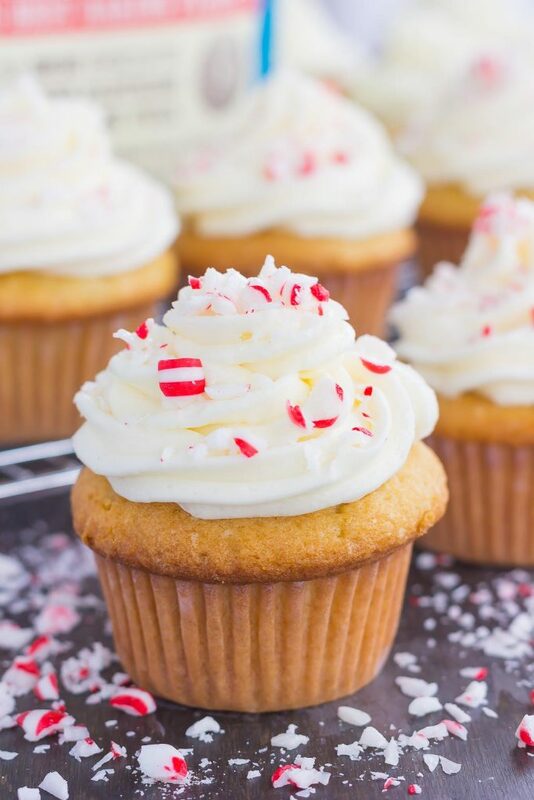 ;) I've never had a peppermint frosting and these cupcakes sound just perfect for the holidays. Bob's Red Mill flours are the best! These cupcakes look gorgeous Gayle! Great job! Love the peppermint candy on top. Pinned to try them this Christmas! These cupcakes are so gorgeous, Gayle! I would never guess you were "bad" at frosting them, because they look totally adorable and delicious. I'm all for peppermint-ty things, and these look too good! Thanks for the cupcake love, friend! Aww thanks, friend! I guess my frosting has gotten a bit better through trial and error. Thanks for the kind words and pin. Hope you have a wonderful weekend, too! These are such festive cupcakes! Looks so yummy Gayle!! What a beautiful cupcake, Gayle! I can't believe it's your first cupcake recipe on the blog - you totally look like a pro with that frosting!! I love how festive these are for the holidays, and who doesn't love a good vanilla cupcake?! Love the flavor of peppermint! These cupcakes look so good Gayle!